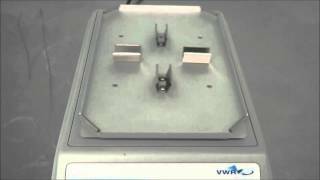 The VWR Plate Shaker provides reliable, digital and variable shaking of microplates for a variety of applications. This microplate shaker will hold up to 4 microplates at one time secured to the platform using retaining springs, shaking at speeds between 100 - 1200 RPM, with a 3mm orbit. The smooth orbiting action is made possible with the brushless DC motor and permanently lubricated ball bearings. The VWR Plate Shaker is ideal for immunoassays and general shaking, and can accommodate standard microplates, deep well blocks. This ruggedly built plate shaker is designed to operate in lab environments such as cold rooms (-14° to 140°F) and CO2 incubators tolerating up to 80% non-condensing humidity. This Orbital Plate Shaker has a low-profile design with upfront digital controls, from which users can set their desired speed, as well as time, with a countdown function that powers off at completion. An audible alarm to let you know when your runs are done. This VWR Plate Shaker has been fully inspected and is performing without issue. All of our lab equipment comes backed with our standard warranty. Should you have any questions, please don't hesitate to contact us.